And so goes a TV commercial way back in the 70s. Now, for a very impressionable youth, who was a Coke devotee, taking a sip of this “new” cola drink was unthinkable. “What the heck is RC Cola?”, I asked my gang of cola drinkers. “Oh, it’s a poor man’s cola drink.” said my wise and venerable gang of cola drinkers. At 15 centavos per an 8 oz. fix, RC Cola was 15 centavos cheaper than the two popular cola drinks in the Philippines back then! So, my gang of cola drinkers and I tried RC Cola. To my surprise, the cola drink was less sweet and did not cause "brain freeze" when quickly chugging an ice cold RC Cola. Cheers to RC Cola then. With 30 centavos, I had 2 bottles of cola drink instead of one. So whatever happened to RC Cola? The Martial law years and weak product marketing probably curtailed the growing popularity of the soda pop in the 70s and 80s. However, I think there were still pockets of establishments that were selling RC Cola back then. RC Cola was invented by Claud A. Hatcher, a pharmacist in Columbus, Georgia, in 1905. Chero Cola was introduced to the U.S. cola-drinking public together with a handful of refreshing drinks such as Royal Crown Root beer, Royal Crown Ginger Ale and Royal Crown Strawberry. Sometime in 1934, Chero Cola was reformulated and changed name to just Royal Crown Cola, or RC Cola. In the battle of cola drinks, RC Cola may be deemed “losing” in terms of popularity and marketing ploy. However, when it comes to the actual taste, many cola aficionados conclude RC Cola is more “memorable”. After decades of drinking the most favored cola brand, I was presented with a chance to taste RC Cola once again and here is my verdict. The flavor of Royal Crown Cola is quite distinctive. In truth, it tends of leave you craving for more. The cola taste is more concentrated but not overpowering. The initial sip has a tang of bitterness but the aftertaste is sweet and pleasing to the palate. I expected a searing sensation down my esophagus on the swallow but experienced none. This could be attributed to the fact the RC Cola is frothier and therefore “lighter”. The thing is, the bubbly carbonation goes out flat quite quickly OR maybe that is just my opinion since I got use to the seemingly unending wave of “carbon” down my esophagus at each initial gulp of the more popular cola drink. 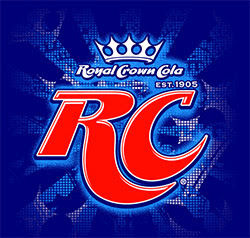 The original RC Cola formerly used cane sugar as sweetener but current formulation now uses high-fructose corn syrup. However, compared with other cola drinks, the fructose content is less which makes for a smoother ingestion of RC Cola drink. Ok, fine… RC could have been more creative with their logo design but hey! We are not buying the drink for the packaging. RC Cola is now available in 330ml can and 240ml, 800ml and 1.5ml bottles. It is now heavily being marketed in the Philippines. As a matter of fact, you can now buy in supermarkets, groceries and even in your friendly neighborhood convenience store. for it's a MAD, MAD taste of Cola...RC! the one with the BIG, BIG taste! The taste is truly :liberating!